This peak is #55 on the Height List for Yukon Territory . This peak is #30 in Prominence List for Yukon Territory .Queen Mary is a big, glacier-covered but gentle massif east of Mount Logan. 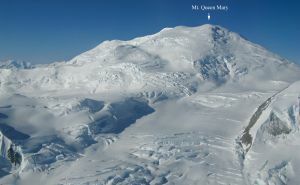 Its summit offers a spectaclular view of Canada's highest mountain.